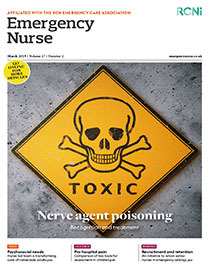 Compassion is a topical issue in clinical nursing practice, nurse education and policy, but a review of the literature reveals that nursing students’ experiences of compassionate care receives little attention. In this three-part series David Hunter and colleagues explore compassion in emergency departments (EDs) from nursing students’ point of view. Part one provides findings of a professional doctorate study of nursing students’ experiences of compassionate care in EDs, part two explores the barriers to compassionate care in this clinical setting that emerged from the study, and part three considers factors that enable and support compassionate care provision in EDs. Aim The aim of the study was to explore nursing students’ experiences of the provision of compassionate care in EDs. Method The underpinning methodology was an exploratory-descriptive qualitative design. A total of 15 nursing students from across the west of Scotland, who had been placed in eight different EDs, participated in face-to-face interviews which were audio recorded, transcribed and analysed. Findings Two major themes emerged ‘doing the little things’ and ‘a strange, new world: the uniqueness of the ED’. The students also identified barriers and enablers to providing compassionate care which are discussed in parts two and three. Conclusion Despite the challenges of working in the most acute of clinical settings, nurses can provide compassionate care to patients and their relatives. However, this is not universal because certain groups of patients considered ‘challenging’ do not receive equitable compassionate care.